Almost a fifth of Scotland is managed for grouse shooting. The true extent of grouse moors in Scotland is unclear but they are estimated to cover somewhere between 1 million and 1.5 million hectares, between 12-18% of our country’s landmass. The very fact that we don’t know for sure shows the desperate need for land reform to move up the agenda again. However, if this statistic isn’t shocking enough, that so much of Scotland is used to kill small birds for fun, its economic insignificance is startling. The grouse shooting industry proudly claim that it contributes £32 million to the Scottish economy. This means that almost a fifth of Scotland produces only 0.02 percent of our total GDP figure while adding a huge cost that Scotland just cannot afford. The killing of wildlife on Scotland’s grouse moors is a relentless year-round slaughter, as animals like foxes, stoats, weasels and crows are (legally) killed in their tens, perhaps hundreds of thousands, so that the unnaturally high density and numbers of grouse to be shot can be maintained. Moreover, on average 26,000 native Scottish mountain hares are killed every year, some for ‘sport’ and others in mass killings designed to increase grouse numbers. Many animals are shot, but travel into the moors and surrounding forests and you can see snares and traps littering the countryside in their hundreds and thousands, many of which can indiscriminately kill, maim and wound. The case for Reforming Scotland’s driven grouse moors from Revive on Vimeo. Illegal persecution of Scotland’s rare and protected birds of prey like golden eagles, hen harriers and peregrines is rife. On the day Revive: The coalition for grouse moor reform launched earlier this month, it was revealed by the RSPB that 4 hen harriers recently ‘disappeared’ on Scottish grouse moors. Birds of prey are seen to be a threat to grouse numbers and by many as incompatible with driven grouse shooting and you therefore begin to see a pattern emerging. Scotland’s vital peat reserves are under constant threat from the damage caused by increasingly intense muir-burning which is designed to increase grouse numbers but adds to the risk of climate chaos. Peat is basically Scotland’s Amazon rain forest – if emitted as CO2, this would be more than 100 times greater than Scotland’s annual emissions (SPICe 2012). And it doesn’t end there. Fencing to keep deer out and sheep (which act as diversionary tick mops for grouse) in, can block land access while unregulated hill tracks, designed to ease access for land management, scars our countryside. Along these hill tracks, and throughout grouse moors, you may find grit trays filled with high strength pharmaceutical drugs to medicate the grouse, creating an unnatural environment which is known to actually contribute to the spread of disease. Meanwhile, during the four month shooting season tons of lead shot, used to kill red grouse, are spread across the countryside threatening the health of both our people and our wildlife. The opponents of grouse moor reform might believe that all this is a price worth paying for almost a fifth of Scotland and £32 million. Let’s also not forget the hundreds of thousands of pounds in public subsidies they can receive on ‘agricultural’ grounds – the tick mop sheep help with that. The Revive coalition made up by Common Weal, Friends of the Earth Scotland, League Against Cruel Sports Scotland, OneKind and Raptor Persecution UK has come together to campaign for a better use of Scotland’s land. Serious land reform must be a big part of this as we seek to tie together a movement who care for our people, our environment and our wildlife. We will also produce some visions of better uses for the land that doesn’t depend on all the toxic by-products created by the grouse shooting industry. Thousands of people have already signed the pledge and joined the movement to revive #OurMoors and we need you to stand with us as we prepare to change the face of Scotland together. For more information on the case for reform visit the website below. It is a travesty that so much land is given over to so few for glorified genocide, for so little economic gain. 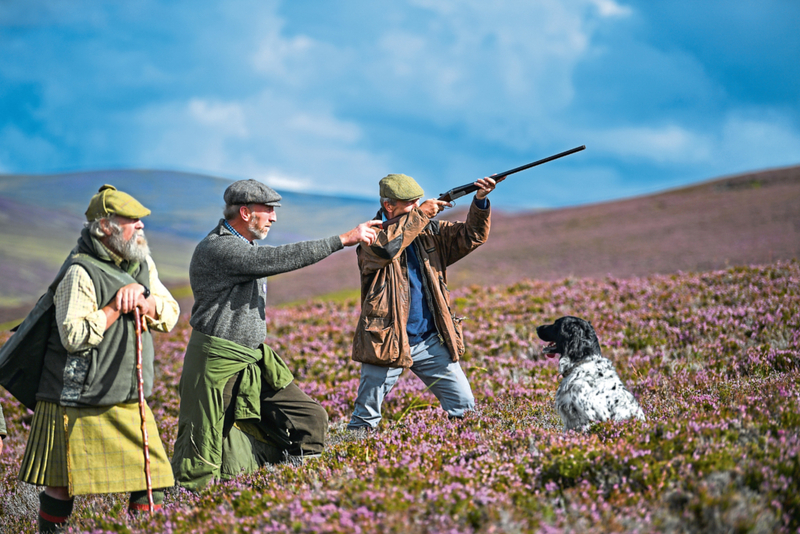 The grouse shooting hobby that shows up the the human species at it’s worst in it’s love of massacre. With 90% species die-off clearly underway, how long before all the grouse vanish despite the best efforts of the psycopaths that indulge in it? Presumably, after that the land owners will just dig up the peat to burn as the oil stops being delivered, accelerating their own demise too. Our Scottish government promises much but is too timid. The use of land here is scandalous, unregulated and at the whim of the few. We set up a land commission but I have not heard from it in over a year. Why is all of our land not now being recorded to a land register; why are the owners of our land allowed to remain anonymous; why are we not imposing a tax on beneficial ownership of land? In his column in the Herald a year or so ago Kenny MacAskill stated that we can’t get the meaningful land reform that we so desperately need because of EU laws. Since 1st minister Sturgeon and her followers are determined to keep Scotland in the EU you can figure what chance we have of getting meaningful land reform. What EU law in particular stops land reform? Can you quote it or did Kenny reference any? Without proof, that’s just another ‘bendy bananas, EU bad’ story. Denmark, a long-time EU member has laws prohibiting land ownership by non-residents. I don’t believe there’s anything other than our own will preventing land reform in Scotland. Let me see if I have got this right? between 1 million and 1.5 million hectares = 2.47 – 3.705 million acres @ £56 per acre Grouse moor subsidy. That means we are giving between £138,320,000 and £207,480,000 to rich land owners, to produce £32 million to the Scottish economy. Would wildlife tourism, forestry, crofting, or frankly anything else, not make more economic sense! and that is before we start talking about endemic wildlife crime, the taking back of tennent farms ‘in hand’, to get the CAP subsidies, and the changing of tennented cottages into ‘holiday lets’, or just bulldozing them, continuing ‘the clearences’ into the 21st century. Who needs conspiracy theory when government can conspire in this way to rob the people of the true purpose of their taxes and rob them of their natural heritage in doing so in order to enrich their landed cronies while the misguided urban populace votes them into office throughout the whole of Britain . This is not just a problem for the peoples party in Scotland to deal with but one which the political voters in England , Wales , and Northern Ireland need to get their heads round and get these conspirators out of office . They say it doesn’t happen but I’ve witnessed it personally in Glen Clova. English group up for the weekend and one of their countrymen who was ‘game keeper’ took them all out hunting them. They were signing God Save the Queen in the Clova Hotel afterward with full approval of the Tory supporting owners- bastards. I think this debate requires to be widened. I don’t know how many of the campaigners for this type of reform are rural dwellers. Can someone enlighten me? Can someone also enlighten me as to what portion of urban Scots would like to live in the country if they had the opportunity? I’m concerned that if the people supportive of this proposal are largely urban based then it could be interpreted that they are trying to force their views on rural dwellers. I don’t know if this is the case . I just want to know as it would help means I suspect a lot of other people make up their mind. I know of SNP councillorsin rural areas who are very concerned that the SNP is losing the rural vote to the Tories in part due to a perception that it is less supportive of rural life . I don’t agree with that perception but it exists. As a campaigner for land reform as the principal source of public service funding I think the focus on what is happening on rural land is one dimensional and divisive rather than look at how Land urban and rural can contribute to public funds and quality of life for everyone. Within the rules of the European Convention on Human Rights Parliament should set the rate of tax on the land types. The responsibility of owners whether corporate, individual or public to pay that will determine better stewardship of land and property and result in the release of land which the owner is unwilling to or incapable of paying. By doing this we remove the emotional and partisan elements and treat everyone the same. Broadly, opposition to driven grouse shooting is lowest in urban areas and highest in rural areas where there is grouse shooting. You can see that on the map here: https://petitionmap.unboxedconsulting.com/?petition=201443&area=sco. This is from the 2016 petition to the Westminster Parliament. The pattern is if anything even stronger across the UK as a whole. Without going too far into your broader point, I think that the estate owners and shoot managers have tried to stifle debate by pointing to their economic contribution (in my vew desultory) and the absence of alternatives (now being shown to be wholly wrong.) Be that as it may, given the high level of entirely spurious and even wrong-headed subsidy under agri-environmental subsidies, I am bound to sympathise with your level playing field point. It would be a start, along with genuine measures against wildlife crime on grouse moors. Speaking from the Black Isle, I count as a rural dweller. Apart from a handful of people employed by local shooting estates, most people I know oppose shooting interests in this area. That includes farmers, forestry people , those whose livelihood depended upon tourism and others. We can all see the damage done by ‘traditional land management ‘ by the shooting estates and we all suffer from it. Far more jobs depend upon a healthy environment and wildlife and the promotion of shooting interests only succeeds because these people have influence and connections. Disagree with you. The management process to encourage a significant grouse population is highly valued to the people whom actually use the land to hunt it versus people that don’t use and enjoy the land. Bird hunters encourage and financially support open lands to have a healthy bird population across the globe. Without upland hunters: there would be far less open land and grass country. This needs to be extended to the rest of the UK . I have Tweeted it and asked all to sign the pledge . England and Wales will only get vicarious responsibility when government is rid of the core of landed shooters . An upsurge in public opinion such as yours in England and Wales could change the face of politics . Possibly the most uneducated, bias, incorrect, one sided, dribble I have read on the topic. If we are truly to reform grouse shooting and land then we need more fact a than the single economic statistic you have here. Bird of prey going missing doesn’t prove anything. Incorrect facts given about hare culls won’t help. Being angry and venomous about it won’t help. These people have enough going against them that we don’t need to make up arguments or use correlation to imply causation. Now, please, if you’re going to put things like this out there you really need to show why these more should be shut down. “Rich people kill stuff and own land” isn’t going to win it! You have the nerve to talk about ‘bias’, whilst trotting out disingenuous platitudes about ‘plausible deniability’, when the pattern of raptor persecution is very clear to anyone with an ounce of sense or decency. Ironically, you and many others only hasten the demise of this Victorian nonsense. encouraging to hear that the Revive Coalition are going to provide “visions of better use” for the thousands of barren acres…ah cannae wait to hear aw the details and the economics that back up their dreams . At last!. The misuse of the land in Scotland is criminal. I did a study on the misuse of the land a good while back, no real interest from SNP though. I discovered that the potential of a Finland sized forest cover was entirely practical, as the climate here grows trees about twice as fast. Basically, the forest products output could equal that fo Finland. (23 BILLION Euros a year). This is somewhat larger than the 32 million of the lairds. If you add to this agroforestry, small farms and crofts, etc, you can get about 35 billion of economic product from Rural scotland. All this would take about 25 years, but in the very first year, would wipe out the 32 million from killing wild life. Nobody is interested. SNP environmental and agricultural ministers totally uninterested in these figures. I gave up. It is a great pity Graham that the SNP Scottish Government seem unwilling to bring forward policies such as you advocate. I know from the shipping/ports perspective the immense significance of Finland’s trade in forest products and you are right that Scotland could be just as big if not bigger. This simply needs the right policies to make it happen. I have also proposed policies for maritime transport/trade that could double Scotland’s international trade and here again there seems a total lack of interest from SNP Ministers, as well as advising changes to ferry policy that could save £billions and improve services as well as give positive impacts to shipbuilding here (Scottish Government are currently building two of the most inefficient and expensive ferries it could possibly build, which no other operator anywhere would specify, when it could be building many more (e.g. 10-20) low cost efficient boats). Quite sad after a decade in office. I get the impression a stumbling block may be senior civil servants who are appointed by Whitehall and in some respects seem to adhere to Westminster diktat (e.g. port and land policy), often telling Scottish Ministers they cannae dae this or that. Scottish Ministers need to get a grip, even to the extent of removing ‘blocking’ officials and appointing senior officials who will always act in Scotland’s interests at least for devolved matters. They need to lead and drive change and be less prone to the negative pressure from officials. Google – “The Calum MacLean project – floating timber down the Spey” and see what was there before the grouse moors – and where it all went. This was really informative nice one, Max. It does sometimes seem that the subject human population of Scotland is putting up as much resistance as picked-for-meekness grouse. Good presentation, learnt more reasons to oppose grouse moors and bloodsports, hope the opposition takes off. The continued (colonial-like) oppression and exploitation of Scots and our land (and seas) is perhaps more due to the fact that most of Scotland social/public institutions including government departments continue to be led by the same privileged anti-independence unionist elites (many if not most of whom are not Scottish) much as they aye have been and the SNP Government has not sought to alter this. They perhaps should. We may have a ‘Nationalist’ government in Holyrood but Scotland’s meritocratic elite remains primarily unionist and hence pro-British. Devolution and a ‘Nationalist’ governing administration (and its many institutions) that is ultimately answerable to an (in many respect ‘foreign’) ‘administrative Power’ inevitably generates conflicts of national allegiance. Fowk cannae ser twa maisters; ye aye luve ane an spite the ither. Hunting for sport should be banned full stop. 26,000 hares are shot, on average, every year. Fascinating stat. That’s seventy two a day. Where did you get it? Donald Trump? Here’s a few interesting facts for you: There are no ticks on the North side of the River Tweed, neither are there any Adders (both thrive on the South side of the river). Sea Trout mainly run the Northern Tributaries and Salmon mainly run the Southern Tributaries of the Tweed. The hills on the North side of the Tweed in the area near Walkerburn and Innerleithen used to be home to huge populations of Grouse and Mountain Hares – now there are virtually none. The reason for this destruction of wildlife is worth investigating and I have to say now that it was not shooting. The disappearance of these species is not good for foxes, badgers or for birds of prey.